The experts will tell you, one of the best ways to attract new tenants to an Apartment, Condo, or Timeshare, raise property values, and boost curb appeal is to install or upgrade an outdoor community area. Installing outdoor pedestal grills in these communal areas is an excellent way to accomplish that. This is because grilling is an appealing outdoor activity that brings people together. While many property owners believe charcoal grills are the cheaper alternative, according to Barbecue University, 68% of American grill owners prefer gas grills. What’s more, the everyday experience of permanent outdoor charcoal grills tells us that people will feel less invested in them. That means, unless you have a staff dedicated to their upkeep, they are likely to be abused, left unused, and become a rusted-out eyesore. Propane and natural gas pedestal grills, on the other hand, have a built-in value proposition that quality tenants understand and respect. A gas grill delivers consistent and reliable heat. That’s a major draw for potential renters. 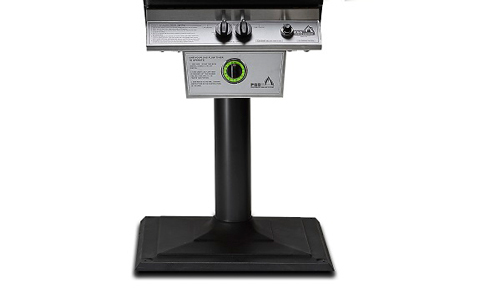 Gas powered pedestal grills startup quickly and easily, and there’s no need to wait for them to heat up. If one party is using the grill while another is waiting, the second group will not have to wait as long to access the facility. That means you can install fewer grills and grilling areas and accommodate the same amount of people as you would with more charcoal grills. With gas, tenants will be able to grill more successfully, which also leads to less mess in the BBQ area. PGS grills that come equipped with the PGS FuelStop® ONE HOUR GAS FLOW TIMER, make it easy for one group of grill users to adhere to a specific amount of grill time, before allowing the next group to use the facility. This 60-minute gas shut-off timer prevents fires and wasted gas while helping to ensure everyone has equal access to the grill. If you’re interested in upgrading property values while enhancing curb appeal, pedestal grills are an ideal focal point. Installing fixed gas PGS grills prevents tenants from moving the grill around causing mess, possible damage, and potential theft. Permanent fixture grills that are attached to an in-ground gas line take up less space on the deck and make an ideal point of focus to build a community area around. A well designed outdoor area is an eye catcher that will save you money and raise the value of your property. That adds up to better returns on your investment- and with the low maintenance you can expect with these durable grills, that’s a benefit you can count on. Because gas powered grills are between 50 and 80% more efficient than charcoal grills, you will be able to install fewer of them. This means you will have more leeway to build attractive community areas that raise property values, are easy to clean up, and look fantastic. Investing in a permanentnatural gas line for your outdoor grill is a decision you will never regret. You may get free installation if your property is near a natural gas mainline. Better yet, over time, natural gas costs about 35% less to use than propane. Natural gas has a smaller carbon impact on the environment. Natural gas also burns cleaner than kerosene, charcoal, and propane. Many tenants and future investors will be more willing to spend their money on your property if they know you are ecologically minded. Using natural gas removes the need to deal with hook-up and replacement of propane tanks. To manage that, you would probably have to hire an on-site professional- or contract out for the service. When it comes to convenience, you can’t do much better than natural gas. As a fuel, it has a reputation for ease of use which potential tenants will appreciate. Set up is the most complicated part of the process, but the gas company should take care of most- if not all of that. Once installation is complete, you’ll be tapped into a valuable natural resource with a low cost to use. 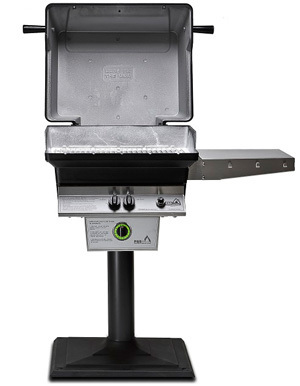 Outdoor pedestal grills come in many different styles, sizes, and price ranges. You may choose a simple post and grill setup, or go for a full-sized range with storage and an array of different grilling surfaces. If you’re looking at a major outdoor remodeling project, you may pattern your entire theme on the look and style of the outdoor grills you choose. After all, most living areas are built around the kitchen or cooking area- which makes the design process that much easier. Whatever type of natural gas-powered, outdoor pedestal grill you choose- it’s sure to draw in interest, improve the beauty of your property, and give other property management companies in your area a run for their money.